A key figure in the film and video workshop movement of the early 1980s, Isaac Julien is now a leading international film and video artist, producing work for cinema, television and art galleries. He was born in London's East End on 21 February 1960, one of five children of parents who migrated to Britain from St Lucia: his mother was a nurse, his father a welder. He attended local schools, and in his teens was involved with Four Corners Films , the Newsreel Collective , and the London Youth Dance Theatre . In 1983, while studying fine art and film at St Martin's School of Art , he co-founded Sankofa , a film and video collective dedicated to developing an independent black film culture in the areas of production, exhibition and audience. Under the aegis of the ACTT Workshop Declaration , Sankofa was funded by, among others, the Greater London Council and the British Film Institute . 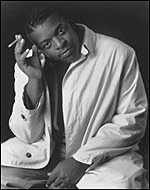 Julien co-directed Sankofa 's highest-profile production, The Passion of Remembrance (co-d. Martina Attille/Robert Crusz/Nadine Marsh-Edwards, 1986), a film inspired by the idea of reconstructing a black political history which recognises the difficulty of reclaiming a past based upon unproblematic notions of identity. At this point, he was already stressing the importance of addressing questions of sexuality and gender in tandem with issues of race and class; and in his next film, Looking for Langston (1989), a meditation on the Harlem Renaissance poet Langston Hughes , he explores black masculinity alongside questions of pleasure and sexuality. Julien has said that music is the only space for a discourse that simultaneously addresses black sexuality, desire and pleasure; and the BFI-funded feature Young Soul Rebels (1991) both explores the tensions between politics and pleasure for his generation of British-born blacks and celebrates that generation's contribution to an interracial youth culture, and the centrality of soul music to that moment. In the early 1990s, Julien worked mainly in television and music video: productions from this period include a four-part series for US television, The Question of Equality (1995) and a music video for Des'ree , Feel So High (1991). More recently he has moved into gallery and museum-based work, with installation pieces including Trussed (1996); The Conservator's Dream (1999); Vagabondia (2000); and the triple-screen version of The Long Road to Mazatlan (1999), which was shortlisted for the 2001 Turner Prize. Alongside his work as a filmmaker, he holds visiting professor and research posts at Harvard University and Goldsmiths College , London. Running through all Isaac Julien 's work is a commitment to examining the politics of sexuality, masculinity and blackness through the distinctive pleasures of the moving image. Informed as it is by a complex multilayering of ideas, his work is always aesthetically pleasing as well as intellectually and emotionally challenging.